Matt Calder, who lives on a remote farm with his young son Mark, helps two unexpected visitors who lose control of their raft on the nearby river. Harry Weston is a gambler by profession and he is racing to the nearest town to register a mining claim he has won in a poker game. His attractive wife Kay, a former saloon hall girl, is with him. When Calder refuses to let Weston have his only rifle and horse, he simply takes them leaving his wife behind. 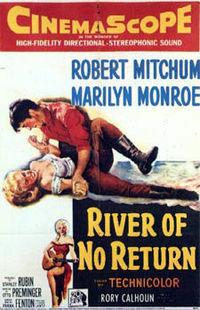 Unable to defend themselves against a likely Indian attack, Calder, his son and Kay Weston begin the treacherous journey down the river on the raft Weston left behind. Set in the Northwestern United States in 1875, the film focues on taciturn widower Matt Calder, who recently has been released from prison after serving time for killing a man while defending another one. He arrives in a tent city in search of his ten-year-old son Mark, who was left in the care of dance hall singer Kay during his absence. Matt promises Mark, a virtual stranger to him, the two will enjoy a life of hunting, fishing and farming on their homestead. Kay's fiancé, gambler Harry Weston, tells her they must go to Council City to file the deed on a gold mine he won in a poker game. They head downriver on their flimsy log raft, and when they encounter trouble in the rapids near the Calder farm, Matt and Mark rescue them. Harry offers to buy Matt's rifle and horse so that reach Council City by land, and when Matt refuses, Harry steals both, leaving his wife, Matt, and Mark stranded in the wilderness.